KATHLEEN McNAMARA and MARY McNAMARA vs. EMMA G. PAGAN and LOUIS A. PAGAN. Plaintiffs bring this action seeking to have the Court determine the location of the lot line separating their property from that of the Defendants, to determine that a fence separating the parcels is a "spite" fence, to enjoin the Defendants from interrupting Plaintiffs' access to the street and "by directing them to either tear down their fence or make a gateway through said fence to provide Plaintiffs with access to the sidewalk," for damages to Plaintiffs in the amount of $25,000 for property depreciation, plus costs and reasonable attorneys' fees. Defendants filed an answer in general denying Plaintiffs' allegations together with a counterclaim seeking to force Plaintiffs to abate their trespasses and for damages in the amount of $10,000., together with costs, disbursements and attorneys' fees. Plaintiffs deny the allegations in Defendants' counterclaim and ask the Court to dismiss them. The Court took a view of the area on May 14, 1982 with all parties and their counsel present. A trial was held on September 22, 1982. A stenographer was sworn to record and transcribe the testimony in the case. Six witnesses testified and eleven exhibits were introduced into evidence and are incorporated herein for the purpose of any appeal. Defendants filed a motion at the conclusion of the trial for a directed finding which is herewith denied. Plaintiffs' motion for the taking of a deposition in Florida is likewise denied. 1. 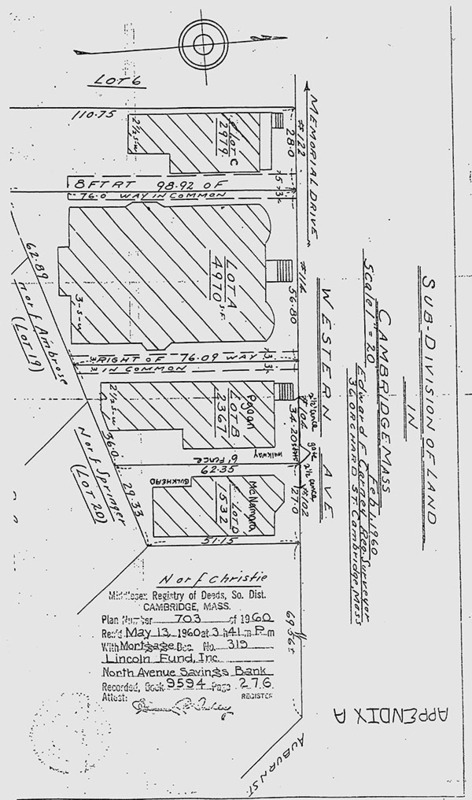 By deed dated August 1, 1966 and recorded in Book 11178, Page 023, (Exhibit 11), Bartel R. Gustafson and Edna M.Gustafson conveyed a parcel of land with buildings thereon known and numbered as 102 Western Avenue, Cambridge, Massachusetts, shown as Lot D on Appendix A [Note 1] to Bernice C. Patterson. 2. By deed dated December 15, 1969 and recorded in Book 11778, Page 662, (Exhibit 9), Bernice C. Patterson conveyed the same premises to Peter Fosdick, Trustee of Aquarius Realty Trust. 3. By deed dated August 26, 1971 and recorded in Book 12064, Page 534, (Exhibit 10), Peter Fosdick, Trustee of Aquarius Realty Trust conveyed the same premises, Lot D on Appendix A, to David and Kathleen Clem as tenants by the entirety. 4. By deed dated August 4, 1978 and recorded in Book 13508, Page 274, (Exhibit 1), David Clem and Kathleen Shelton Clem conveyed the same premises to the Plaintiffs Kathleen and Mary McNamara as joint tenants. 5. Defendants have owned the property at 104 Western Avenue, which abuts Plaintiffs' property to the west and is shown as Lot B on Appendix A, for approximately 18 years, having purchased it from a Mr. Benjamin Orates. No deed to Defendants was put into evidence. 6. Plaintiffs and Defendants have had a number of disputes over the last few years involving Defendants' dogs and children and the	Plaintiffs walking across the easterly corner of Defendants' property to empty their garbage. 7. Reference to Appendix A will show that Plaintiffs' lot contains only 1,532 square feet with 27' frontage and Defendants' Lot B, 2,367 square feet with 34.20' frontage. A low wire mesh fence extends across the front of the two lots separating them from the sidewalk on Western Avenue, running from the front steps of the Defendants' dwelling on Lot B easterly to the front steps of Plaintiffs' dwelling on Lot D. There is a gate in this fence at the northeast corner of Defendants' Lot B leading into a back walk to Defendants' dwelling. 8. On the view the Court observed, and the photos submitted into evidence as Exhibits 2, 3, 4, 5, and 6 show, the area between Lot, D and Lot B, including the 6' wire mesh fence erected by the Defendants along the line on July 7, 1980. Between the wire mesh fence and Defendants' dwelling is the 2 1/2' to 3' cement back walk leading from Western Avenue to the rear of Defendants' dwelling. Three steps lead up from the gate at the northeast corner of Defendants' Lot B at Western Avenue into the back walk as shown on Exhibit 4. Plaintiffs' dwelling on Lot D is separated from the 6' fence along the boundary line between the lots by a narrow grass plot. At the street line on Plaintiffs' side of the 6' line fence is a large bush and undergrowth and the low fence bordering the sidewalk on Western Avenue. Removal of this bush and undergrowth and the low fence would allow egress from the rear of Plaintiffs' dwelling directly to Western Avenue, although over a very narrow strip. 9. The Plaintiffs' usual practice, until the erection of the wire mesh fence by the Defendants, was to empty their trash by coming through their cellar bulkhead and walking down the walk on the Defendants' property to the sidewalk. They testified that they did this frequently and without permission. 10. The Court finds that it would be difficult for Plaintiffs to bring large objects down beside their dwelling to their bulkhead in the rear without going onto Defendants' land although passage on foot is possible. The only other way to proceed would be through the house as there is even less room on the easterly side of Lot D.
11. Bernice Patterson, the owner of Lot D from 1966 to 1969, never lived in the dwelling but rented it, and did not know whether her renters walked across the Pagans' property. She did testify that immediately after purchasing the property she used the Defendants' land to remove trash from the bulkhead. 12. Peter Fosdick, Trustee of Aquarius Realty Trust, resided on the property after the Trust acquired it in December of 1969 and frequently walked across the Defendants' property to deposit his trash on the sidewalk without the permission of the Defendants. 13. David Clem, Plaintiffs' immediate predecessor in title, resided on the property for some 7 years during which time he also cut across the Defendants' property to get to the sidewalk but he specifically asked for and received the Defendants' permission to do so. He did not exclusively cut through Defendants' lot to get to the sidewalk but frequently went down his own front steps. 14. Defendant Mrs. Pagan specifically gave the Clems permission to go across her land but never gave anyone else permission to do so. There are three questions before the Court. 1) Do Plaintiffs have an easement by prescription over Defendants' land; 2) Do Plaintiffs have an easement by necessity; and 3) Is the fence erected by the Defendants a "spite" fence? I. Do Plaintiffs have an easement by prescription? The Court answers this in the negative. One claiming an easement by prescription has the burden of proving that the use has been open, notorious, uninterrupted and adverse for a period of twenty years. Tucker v. Poch, 321 Mass. 73 (1947). Ryan v. Stavros, 348 Mass. 251 (1964). Even if the Court assumes that the Plaintiffs have used this walk beside their house adversely for the four years of their ownership they must prove that their predecessors in title have used it openly, notoriously, continuously and adversely for at least an additional 16 years in order to meet the twenty year requirement. This they have failed to do. One of Plaintiffs' predecessors in title, Mr. Clem, who lived at the dwelling on Lot D for seven years from 1971 to 1978acknowledged the Defendants' ownership of the area and asked for and received permission from Defendants to traverse Defendants' property to reach the sidewalk fronting Western Avenue. (See paragraph 10 herein). A permissive use is inconsistent with adverse use. Ryan v. Stavros, supra at 263. Thus, there is an obvious gap in adverse use and Plaintiffs have not established the elements necessary to prove that they have acquired an easement by prescription. II. Have Plaintiffs acquired an easement by necessity? The Court likewise answers this in the negative for two reasons. First, while an easement may be implied by necessity, the necessity must be real. Necessity which may give rise to the implication of an easement need not be absolute physical necessity but must be a reasonable necessity. Mt. Holyoke Realty Corp. v. Holyoke Realty Corp., 284 Mass. 100 , 105 (1933). In this case there simply is no reasonable necessity as the Plaintiffs have access to Western Avenue via their own property. Their house has a small yard in front with a walkway from their front door to the sidewalk. If Plaintiffs must have access to the bulkhead	for moving large objects into the cellar as they claim they can remove part of their own low fence bordering the sidewalk on Western Avenue and the bush and still pass to the rear of their property. There is no reasonable need for more access than they presently have and this is especially so given the very limited size of both Plaintiffs' and Defendants' lots. Second, an easement by necessity is an easement by implication. This, in turn, is founded in the presumed intent of the parties. Restatement: Property,	§§474-476. Such easements can be implied only for the benefit of or against parties within the same title chain. There has to be a common grantor somewhere in the back chain of title who impliedly reserved an easement and it must carry down to	the present predecessor in title. It cannot be for the benefit of or against strangers to the chain of title. Uliasz v. Gillette, 357 Mass. 96 , 102 (1970). As there is no evidence of a title chain wherein there was a severance of title, these parties are strangers and thus there cannot be an implied easement by necessity. III. Is the fence erected by Defendants a "spite" fence? The Court finds and rules that it is not. This fence, which is a neat, well constructed wire mesh fence, is six feet and two inches at most in height. There was no evidence introduced to show that it unnecessarily exceeded six feet in height nor was there evidence to show that it was maliciously erected to annoy the adjoining owners. It does not come within the purview of G. L. c. 49, §21. In sum, the Court finds and rules that the Plaintiffs have no easement by prescription or by necessity and the Defendants' fence is not a "spite" fence under G. L. c. 49, §21. No damages have been proven by the Defendants herein and the Court awards none. [Note 1] Appendix A is a copy of a plan entitled "Subdivision of Land in Cambridge, Mass., Feb. 1, 1960, Edward F. Carney, Reg. Surveyor," which plan is recorded with Middlesex South District Registry of Deeds as Plan Number 703 of 1960, Book 9594, Page 276.